Your catering service can lead the way to providing healthier foods and drinks! Many workplaces and other organisations are becoming more aware of how the food and drinks they provide can impact on the health and wellbeing of their staff and visitors. They are seeking ways to offer healthier choices through catering and other areas where food and drinks are provided. That’s where you come in! As a catering provider, you can help to support these organisations and secure their business by offering healthier options through your catering menu. establish yourself as a leader of healthy catering within the catering industry. provide themselves, or make on site, catering that is in line with the Healthy Choices guidelines: healthy eating policy and catering guide for workplaces. Visit Taking action and Food and drink ideas for more information about how you can start making healthier changes to your catering menu. 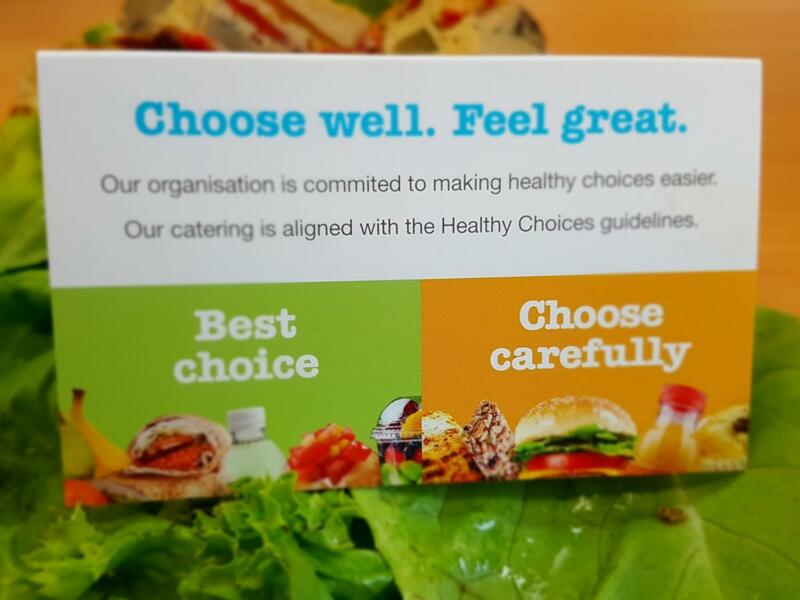 Promote your healthy GREEN and AMBER catering options by displaying the Healthy Choices signage with your platters. Find out more here. For support or more information about supplying healthier food and drinks, contact us on 1300 22 52 88 or email us.